Use these guidelines (plus some good old-fashioned common sense) to ensure that you and your little adventurer stay safe as you two explore the world as one. Every single element of the Boba Wrap—from fabric to finishing touch—is designed for totally safe baby wearing, so all you have to do is enjoy the ride. Security sure can look cute, can’t it? Chin up. Face visible. Nose and mouth free. IMPORTANT SAFETY NOTE FOR PREEMIES: Upright is all right. In fact, it’s the only safe position for your precious little pumpkin. Preemies, low-birth-weight newborns and babies with upper respiratory infections, low muscle tone, or GERD should always be carried in an upright position—never in a horizontal “cradle,” or “hammock” position—because having legs swaddled together is not ideal for hip development. This is especially true in infants with pre-existing hip dysplasia. So remember, when you’re getting out there in the world, make sure baby is upright there with you. Face covered and/or pressed tightly against wearer. Baby curled with chin touching chest. This is pretty much a no-brainer, but you should always be certain that your baby can breathe easily. Newborns don’t have the muscle control to open their airways with their chins against their chests, so always avoid this position. Also, make sure no fabric covers heads or faces and that your baby’s nose is parallel to the floor, or higher (for naps). You can use the wrap to support his or her head while sleeping. Your baby should be snug against your body and high on your chest—basically in the same position your arms would hold him. If your back hurts when you’re wearing your baby, the wrap may be too low, too tight or the fabric may be twisted. Your baby’s face should be at or above the rim of the baby wrap (close enough to kiss kiddo’s forehead). After nursing, remember to re-tighten the wrap to this position if necessary. In the upright position, your baby’s knees should be pulled up to hip level or higher in a frog-like position. The seat of the wrap should be pulled to reach the backside of his knee to fill out the hip socket, align the pelvis and place the spine in a natural rounded position. Don’t tuck your baby’s legs under his or her (cute little) bottom. This places pressure on his legs and may impede blood flow or pinch a nerve. The wider the fabric is spread, the more supportive it is. Regularly give your wrap a carefully once-over to be sure that the fabric and seams are all good to go. Use the right carrier for your baby’s stage. A baby wrap is not a safety device and it does not replace a car seat. For these reasons and about a million others, do not wear your baby in a wrap when driving or riding in a car or while riding a bike. If there’s an activity you wouldn’t do while pregnant or one that requires protective gear, don’t do it while babywearing. That means no climbing ladders, riding horses, running, skating, skiing, swimming, mowing the lawn, cleaning with harsh chemicals, skydiving, white water rafting, bungee jumping…you get the idea. For all those times you need to bend over, lean, adjust the wrap or move in some other awkward way (parenting…are we right? 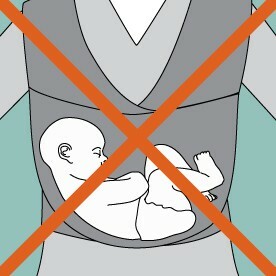 ), be sure to support your baby with your arms and don’t let go of your baby until your position is back to neutral. Just like when they’re out of the carrier, babies need sunscreen and appropriate clothes. Don’t let your little one get too hot in the summer (overdressing can cause heat stress) or too cold in the winter. 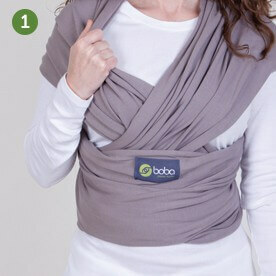 Before baby takes his place in the snug and stretchy Boba Wrap, you have to get it on. How’s that for pointing out the obvious? Good thing it’s easy. 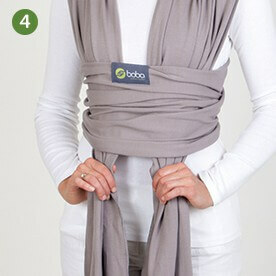 Both Boba wrap holds (the newborn hold and the “love your baby hold”) begin with this one simple tying method. Unfold the wrap and find the Boba logo at the center. With the logo facing outward over your navel. Cross the two outstretched pieces behind your back. Bring each side up and over your shoulders to the front while keeping the fabric stretched. Try to keep the fabric flat so it doesn’t twist. Take both pieces in one hand and tuck them under the section with the logo on it while keeping the tension. Pull down. The logo piece will rise to your chest and should be adjusted to fit snug and cling to your body. Cross the pieces and bring them around your waist behind your back. Make sure that the pieces cross each other high on your chest area. Your sternum is a good reference point. There is no need to leave any extra space for your baby. Cross the wrap behind your back and if there is enough fabric, bring it back to the front. You can tie a double knot behind your back, in the front or on your hip. This hold is ideal for the newest additions to your fun-seeking family (those who weigh 2 pound (0.9kg)–10 pound (4.5kg) to be exact). One thing though: if your baby tips the scale at less than 5 pounds, please discuss proper babywearing techniques with your physician and review all of our baby wrap safety tips before suiting up in your Boba Wrap. Once you’ve tied the wrap on your body using our baby wrap tying instructions, take the shoulder piece that is closer to your chest and pull it away from your body. Boba Wraps are made of strong, stretchy material, which makes them easier to put on since you don’t have to leave room for baby. Slide your wee one down your chest (facing in) and into the shoulder piece being careful not to separate his or her legs. Leave the legs tucked in the frog position or “fetal tuck,” and spread the fabric wide over your baby’s entire body. 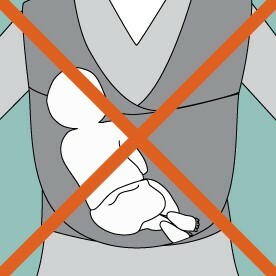 Securely hold your baby and spread the other shoulder piece over your baby’s body. Pull the logo piece up and over your baby’s bottom and to the back of the neck ensuring that he or she is in a fully upright position. 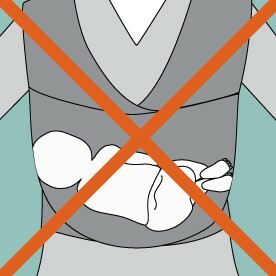 Horizontal or “hammock” positions and outward facing positions are unsafe and should not be used with a baby wrap. For older babies who may be too big for the newborn hold, but still love being heart-to-heart with mom or dad on the go, you can’t go wrong with this hold. The “love your baby” hold keeps 8–35-pound (3.6kg-15.8) babies close to you even as they grow. 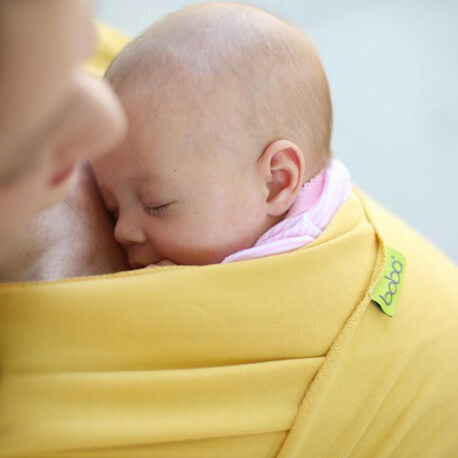 Once you’ve tied the wrap on your body using our baby wrap tying instructions, hold your baby securely and carefully pass his or her leg under the shoulder piece that is closest to your body. 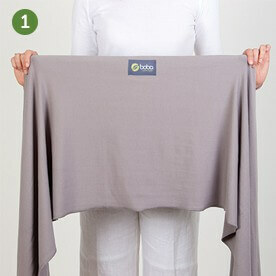 Spread the fabric wide over your baby’s bottom, back and shoulder. The wider you spread it the more comfortable baby will be as you embark on your adventures. 1. Ever so gently push your baby down in the wrap. The area where his or her thighs meet the torso is a good place to put your hands as you push downward. 2. Reach under the shoulder strap and lift your breast to baby’s mouth. 3. Keep in mind that you’ll still be tummy to tummy. Your baby needs to stay completely vertical while in the Boba wrap, so don’t try to latch them on in a cradled position like when you nurse sitting down. 4. Want a little extra privacy? We can jive with that. 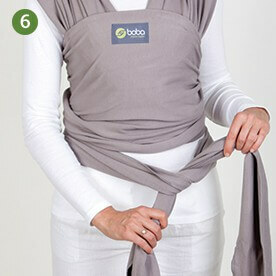 The Boba Wrap allows you to easily stretch the shoulder strap fabric for some added mom and/or baby coverage. Just be sure you can still see your baby’s nose and mouth. 5. For the times when latching in the wrap just isn’t in the cards, take your baby out and nurse normally. 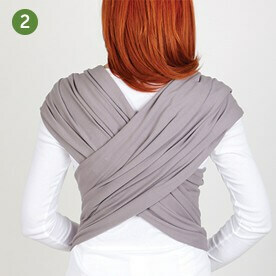 When nursing with your baby out of the wrap while still wearing it, the two pieces of fabric that cross in the front double as a discreet cover-up.